The following is a list of the some of the more popular options for the Beck Speedster®. We specialize in building to customer specifications, so if you do not see an item listed below... just ask. After more than 30 years in this industry there are few requests that we have not heard in the past. We pride ourselves in our ability to provide the highest quality products available. 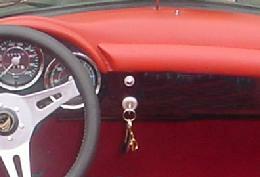 Dash grab handle: This high quality part goes on the passenger side of the BECK SPEEDSTER® dash. Additional VDO Gauges: The additional gauges seen here in the center of the dash are available in Cylinder Head Temperature, Clock, Oil Pressure, Oil Temperature, Outside Temperature, Voltmeter, and Ammeter. These are not original to the car, but are available for those who enjoy more information. Leather covered A/C valence with 2 chrome air outlets also pictured here. Replica Nardi Steering Wheels: a nice added touch for your Beck Speedster®. 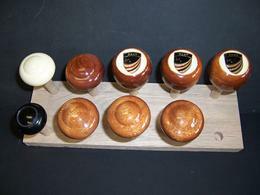 Matching Mahogany Shift Knob: Available to match your steering wheel selection from the above. Custom made. All are 12mm x 1.5 pitch threaded. Shown here are the standard Black knob that comes on the Speedster, the matching mahogany "mushroom" knob to match your replica wooden steering wheel selection ($95), and the mahogany knob available with the BECK Emblem inset in the top. (clearance price $99, call for clearance details.) Ivory mushroom shown is available with the Ivory trim upgrade package. Application: All BECK Speedsters, and rod shift version BECK Spyders. Non-BECK Speedsters with 12mm shift handle. Chrome Starter Button: the starter button adds a nice vintage touch to your BECK SPEEDSTER®. Chrome Interior Door Pulls: a functional and attractive addition to the interior door panel. Show quality chrome finish and a convenient location combine to reduce the stress on the door release handle as well as the need to pull on the tops of the doors leaving unsightly fingerprints on the paint. Stereo Systems: We offer a wide variety of choices when it comes to your stereo system. From a basic AM/FM/CD system, to a custom 8 speaker Infinity surround sound masterpiece with MP3, navigation, Serius/XM, and ipod capabilities. We offer a variety of configurations and locations to suit your needs. Pictured here is our standard "below the dash" installation with in our color matched leather radio pod. Pictured here incorporated into our lower air conditiong valence. Another Special Edition, Inc exclusive feature. 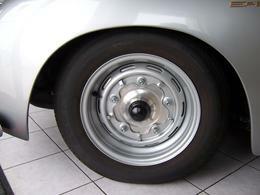 "Wide Five" Upgrade: "Wide-Five" bolt pattern (5 x 205mm) Wheels available in powdercoated silver-gray, with aluminum turned skins on top pf the VW brakes to give you the look of vintage aluminum drum brakes. Fluted Headlight Lenses: BECK cars can be fiited with both clear and fluted headlight lenses. The Beck Speedster® comes standard with clear lenses, but can be upgraded to fluted lenses, as pictured. Headlight Grills/Stone Guards: Available in the later "mesh" style, pictured left.We find these are the most effective and highest quality of the styles currently available. European Bumper Guards: These polished aluminum bumper guards are a beautiful addition to any speedster. 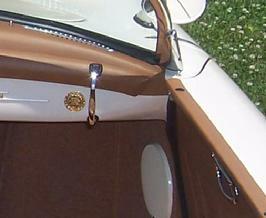 Full Tonneau Cover: One of the most popular options for the Beck Speedster®, the tonneau cover allows a quick and easy way to close your cockpit. Riding alone? Just unzip the driver's side and off you go. Available in a vinyl or cloth, in a wide variety of colors. 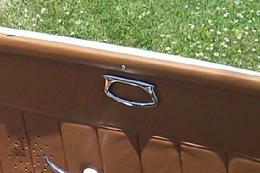 Luggage Racks: The "entry level" polished stainless rack (pictured left) is a loose recreation of the very early, smaller luggage racks. Other racks available, see below. This rack is an exact recreation of the larger Reutter luggage rack finished in hammertone silver. The large Leitz chrome plated rack is also available. Luggage Straps: Handmade by world famous saddlemaker, Dusty Johnson of the Pleasant Valley Saddle Shop, these leather luggage straps are a beautiful addition to any BECK. Available in black or tan. Custom colors upon request. Photo courtesy of Dusty Johnson.